In recent years ,there was a tremendous growth in online Game industry .Almost All these games are based on Adobe’s flash technology and you need to play them online . Surely this is not possible for a normal flash game addict to afford the cost of network bandwidth to play them online .But now you can download and play these online Flash Games on PC . .First step to download the embedded flash game into our PC. There are many internet tools allowing us to save online videos , animations ,and flash (swf) files.Among which , you can either use the firefox addon to save flash files or a service File2hd .File2hd is yet another free service for saving embedded web images , videos , music , flash and animation files . Go to File2hd , enter your target online game link and click on get files .As shown in image , we will get the direct link to the flash file that can be easily saved to PC. Now for playing these flash games offline , there are two main methods . 1. Play online Flash Games on PC using offline web browser . Just right click and open the flash file in any of your browser: Opera ,Firefox or IE . Download flashoffliner here . After installation ,right click and open up flashoffliner menu from taskbar . 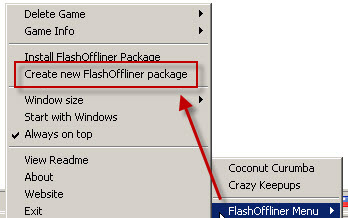 Click on create an new FlashOffliner package . 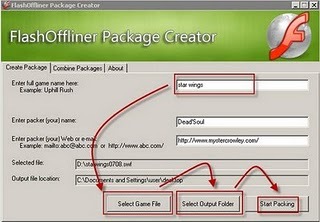 Give the exact file location of the downloaded flash game on PC and follow the procedures as shown in the figure . Now ,when each time you want to play a packed game , open up the Flashoffliner menu from taskbar and click on any of those previously packaged games. Please not that I am writing up this tutorial for free online flash games .